Today is a special day – June 7th! My parents married on June 7, 1943. Dad left for the war less than a month later. He and my mother didn’t see each other for two years. Mother passed in 2008. Dad is now 89, and he looks good and is in pretty good health. He becomes frustrated at times because he can’t remember like he used to. But today when I talked to him on the phone I asked him did he know what today is and did he know what yesterday was. Of course, when I mentioned that it’s his and Mother’s anniversary, he remembered all about that special day. He had forgotten that yesterday was the D-Day anniversary until I mentioned it. He said, “I wouldn’t have thought of it, but now that you mention it I well remember that day.” He was in the Office of Strategic Services and was the one in his secret office in Paris, France that decoded the message. It was his duty to get that message out immediately to the front lines. Years pass by so quickly. I miss my mother. I am grateful, though, that I still have Dad and that he and I can have conversations such as the one today. “Yes, and I’m your only girl!” Spoiled? Maybe a little. This morning I started the day out with a veggie omelet – spinach, sweet yellow onion, orange bell pepper, cheese and eggs. I mentioned to my dad that the next time I come visit I’ll make him a vegetable omelet like I had this morning. He liked the idea. I don’t recall any omelets for breakfast when I was growing up. We always had scrambled, fried, or boiled eggs – and always bacon or ham. When I talked to my dad, I told him how I’ve been working out in the yard pulling weeds, getting my exercise. He laughed. He always told me I’d have to watch my weight for the rest of my life. He wasn’t kidding! I told him this morning that I’ve lost some weight and that it feels good to be getting into smaller clothes. Daddy was a good cook, too. He made the best pancakes and bacon. When I was little, I would be mesmerized by watching him flip those pancakes high off the griddle. The pancakes would land right back on the center of the griddle. It amazed me. I still love pancakes and bacon. Breakfast must be on my list of comfort foods because I like it so much. The photo of my parents in the pink frame (shared in this post for its pink to list it over at Pink Saturday) has a special story. When they got married, there was no huge wedding. A friend took them to a little church in the community where a pastor friend married them. No fancy wedding plans, parties, or even pictures. 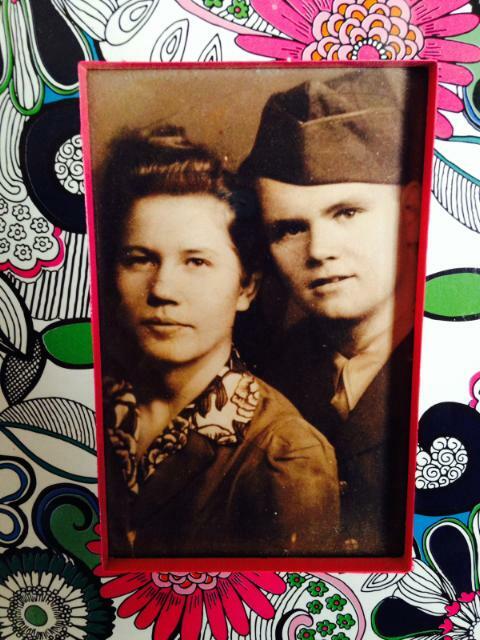 Since he went off to WWII quickly after the they married, Mother had a picture made for him and sent it to him. He had a picture made in France and sent it to her. Many years later – I think for their 50th wedding anniversary – she had a photographer merge the two photos together. It’s amazing the special effects that can now be applied to old photos such as this one. Learn more about Dad’s experiences in the Office of Strategic Services and Mother’s Home Front experiences in my book Phantom Seven. What wonderful memories of your dad in the kitchen! It sounds like he had some good kitchen skills. My mom and I tried flipping pancakes once. It was hard getting that one off the ceiling. Yes, they are wonderful memories. I can just picture you and your mom flipping pancakes and them landing on the ceiling. LOL!